Preface, 1. Introduction, 2. The politics of judicial independence and accountability, 3. The new Lord Chancellors and the Executive, 4. The courts service, salaries and pensions, 5. Relations between judges and parliament, 6. 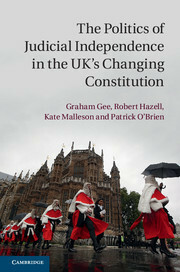 Judicial leadership and the internal governance of the Judiciary, 7. Judicial appointments, 8. The UK Supreme Court, 9. Scotland and Northern Ireland, 10. Conclusion. Robert Hazell is Professor of Government and the Constitution and Director of the Constitution Unit at University College London. Kate Malleson is Professor of Law at Queen Mary, University of London. Patrick O'Brien is a Fellow in Law at the London School of Economics and Political Science.